Do you monitor your brand on Twitter…? There’s no shortage of people who like to use Twitter to talk about themselves, but how many use it for listening? There are so many great tools out there for monitoring Twitter (we use both Tweetdeck and Hootsuite) that there is really no excuse for not doing it. To paraphrase Oscar Wilde, there’s only one thing worse than being talked about on Twitter and that’s not knowing you’re being talked about on Twitter. When we act as Community Manager for clients, we monitor the conversation about a client’s brand and key phrases and participate in it on a regular basis. Confidentiality prevents us sharing some of our own examples, but our recent Tweet about the use of QR codes prompted a reply from Inghams’ Marketing Manager, Louise Newton (who is launching QR codes as an integral part of their advertising). First to follow up on the original Tweet was @Meticul, which monitors Tweets with the hashtag #QRcode and then aggregates them into a daily digest, tagging the original contributors. (You may have noticed a similar ski digest by @SkiPad). This was followed by was @TheWineBot, which apparently searches for mentions of ‘wine’. They Retweeted Louise’s reply, with the cute addition ‘Enjoy your wine’. No sales pitch, just nice engagement. 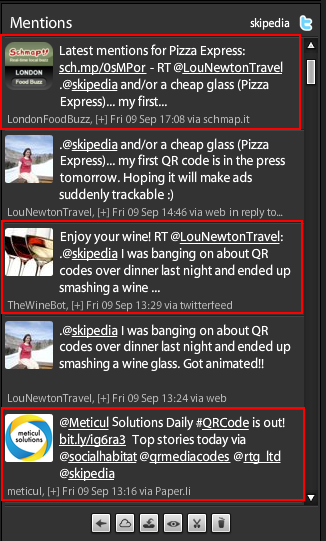 Within three hours of Louise’s follow up reply, @LondonFoodBuzz had noted the mention of ‘Pizza Express’ and Retweeted again. 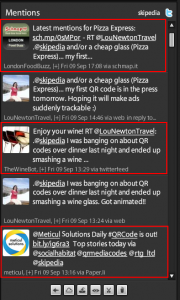 There’s no strict commercial advantage to any of these Tweets, although the Meticul example demonstrates how good use of hashtags in Twitter can increase your reach, and the WineBot does lead you to @TheWineGuide.